Smell natural gas in the home? Do you know what to do? What do you do if you smell natural gas in your home or a building? Alternatively, what if you smell it outside? Of course, this is a trick question since natural gas is odorless and technically you are smelling the odorant in the gas stream. In any case, if you are sensing that rotten egg, sulfur-like odor then you know that there is a good chance that natural gas is present, and you need to take action. 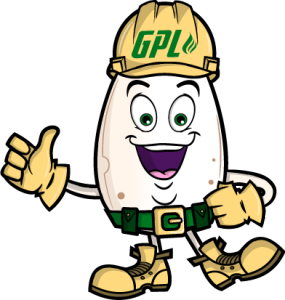 The most common indicator that there is a natural gas leak is the mercaptan rotten egg smell. Additionally, you may hear hissing or a blowing sound, perhaps from a gas appliance or the source itself. This may be very soft or deafening depending on the line pressure. Outside the building, you may see dead, or wilting plants or trees. Drooping leaves and flowers or discolored fruit and vegetables can alert you that there may be a natural gas leak in the area. It is also possible to see spiraling or swirling dirt. Lastly, if you see bubbles in standing water, it may indicate that natural gas is present. What not to do if you smell gas? Do not touch any electrical switches (do not turn them on or off). Do not use any electrical appliances or devices including doorbells, garage door openers, telephones, elevators; do not even use your cell phone near a suspected leak). Do not light a match. Stay away from any ignition sources or open flames (do not attempt to blow it out). Do not start any motor vehicle engines or electrical equipment. Do not attempt to repair a gas leak. What to do if you smell natural gas in your home? You should use some discernment. Is the odor very slight or is it strong? If it is strong, leave the building immediately. If it is very slight, open the windows, then leave. Go to a safe place, outside the smell of gas (certainly not downwind of it) and call 911 to report a gas leak. Of course follow any directions from the emergency responders. MercapMan is the company mascot of GPL Odorizers, the manufacturer of eco-friendly odorization equipment. It is MercapMan’s mission to educate the public that the nasty smell commonly associated with natural gas is a good thing because disasters are imminent without it.